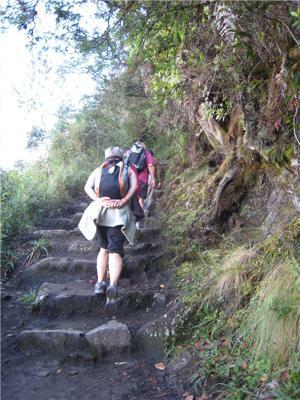 For many just reaching Machu Picchu (old mountain) is a dream come true. It is one of the seven wonders of the world and no matter how many times I visit I never tire of spending time in this ancient city. If it is a spiritual experience you want then just being in the energy will kickstart that. Drift away embracing the history and allow yourself just for a moment to wonder what it must have been like living in Incan times. What an advanced race with a true sense of community and spiritual practice. This becomes very obvious as our spiritual archeologist explains the true meaning of the different areas within the city and what they were used for. 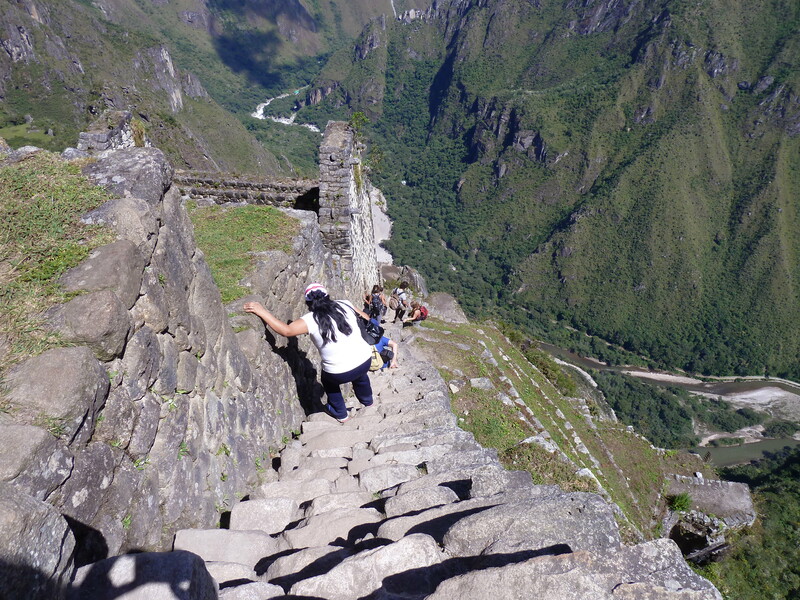 Wanyu PicchuTo enhance your spiritual experience I highly recommend you take on the challenge of climbing Waynu Picchu (Young Mountain). No matter from where you stand it looms tall, proud, regal and mysteriously before you. How do people shimmy up the sheer rock face? No ropes to hold onto, 500m up to the Roof Top of the World! As you commence the climb you notice many who are treating it like a race, passing you one after the other. Keen to conquer the climb they wonder how fast they can make it to the top? Our group purposefully goes slow taking a bend or two at a time. Stopping to savour the view, listen to a teaching from our spiritual archeologist and feel the energy as we begin to understand what the climb is about. A cleansing, an initiation a releasing of long held fears. To walk this climb with a purpose allowing yourself to connect with it more strongly with each step that you take is a very powerful experience. There is no need to rush and just as the famous saying goes. It is not the destination but the journey. On reaching the top you have to weave yourself through a tight opening in the rock so that you can sit right on the highest ridge of the mountain. It is pretty challenging! This is where the initiation is completed. As you stand on this side of the entrance you bring with you all of your experiences to date, your fears, your dreams, your beliefs. As you walk through you have an opportunity to set new goals, to release any fears and re-programme your beliefs with a very specific intent. Sitting up on the top of the Roof Top having completed the journey and experience at so many levels you will have renewed energy to climb down the next 300m to the Temple of the Moon. Many people do not take this part of the journey. They just rush back down still focusing on how fast they can do the whole climb not even knowing the other exists. With very few people around you will love what you discover. A temple that is hidden in the rocks with seats carved out that you can sit in and soak up the special energy within the space. It is not for the faint-hearted though, with another 300m to climb from the Temple of the Moon back to the starting point you will be pleased you took it slowly and made it a full days excursion. With huge steps to conquer on your way back through beautiful bush and peaceful surroundings it will take you back to the Lemurian times where the people were said to be very tall. They must have been to climb the huge steps!